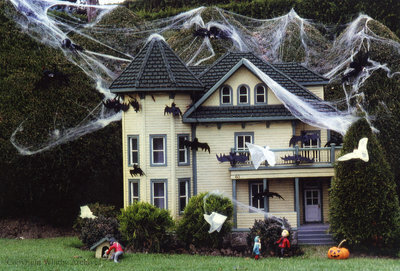 A colour photograph of a miniature house decorated for Halloween in the Miniature Village at Cullen Gardens. Two miniature people can be seen standing in front of the house with a miniature person petting a dog by the dog house. Halloween at the Miniature Village, Date Unknown, Photographer Unknown. Whitby Archives A2013_042_108.